"I'm not leaving until you laugh." If you've ever fallen into the black hole that is reality cooking TV, you know that Gordon Ramsay isn't exactly the nicest person. But even though he's mean AF to adults, he's basically Mary Poppins when talking to children. Gordon: "So I'm not leaving until you laugh." Gordon Ramsay: "Oh goodness me, look at the size of my cheeks. Right, what a good idea. They're all for me! 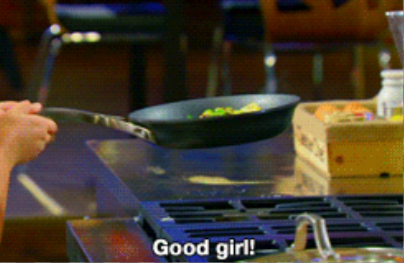 I'm the chef." Gordon: "You can't expect to be at the top of the class every time. What you've done so far in this competition, that is not your best plate. Come on here. I don't want you to get upset. Come on, get your head up." Gordon: "Don't you worry, my darling. Let's start again. Now, let's get this going. We can do this, okay? We've still got time." 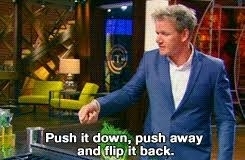 Gordon: "Push it down, push away and flip it back. Good girl!" Gordon: "Can I try that? Looks very cool. Have you been to Japan? Does that suit me? Do I look like some karate kid now?" Gordon: "Dara, how are you feeling?" Gordon: "Do you think it will come out? High?" Gordon: "Have you prayed yet?" Gordon: "Every time I put a soufflé in the oven, I always pray." Gordon: "Dear God of Soufflé, please make that rise and taste sumptuous and delicious. Good luck." Matilda: "Yeah, those onions made my eyes water." Gordon: "I've got just the thing." Gordon: "MAN! Whose done the salsa? There's no salt in that! Who forgot to season the salsa?" Gordon: "Don't be upset. Fill the mold half full, and it'll cook twice as quick. Okay, relax. Well done."